Last night I tagged along as the lovely Katy Walsh’s plus one as she reviewed Victory Gardens’ The Gospel According to James for her blog, The Fourth Walsh. Now, because I wasn’t invited as press (which is typical for Victory Gardens), I’ve no obligation to write anything about this production. But I will because this is a play very much worth seeing. I appreciated that Smith’s play avoids the obvious. Instead of focusing solely on the evils of racism, he tells a story about the complexities of looking backward, rebuilding history from faded memories and digging up pains of the past. While he doesn’t make any definitive conclusions about the value of reopening old wounds, the point is raised and thoughtfully analyzed. 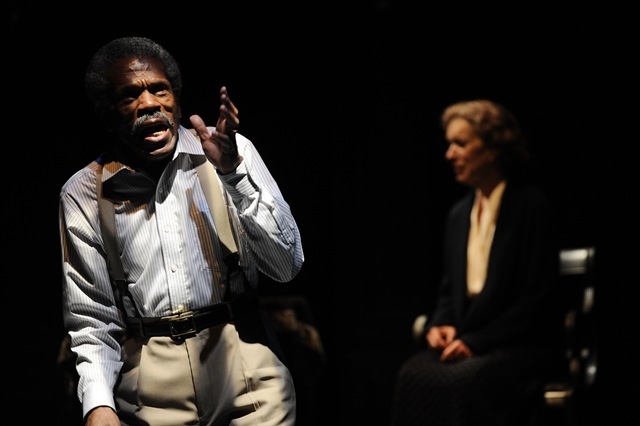 Smith achieves this by reuniting two people who were intimately involved with the events leading up the lynching fifty years after the fact: James (André De Shields) and Marie (Linda Kimbrough). They each have wildly different recollections about those days leading up to the tragedy, with each narrative playing out before them. James has profited from telling his version of the story, which is cast with clearly defined villains and victims, to documentary makers. This infuriates Marie, as her deeply repressed recollection of events casts the main players in a much more complex light: they are flawed humans with many redeemable qualities — some more than others. The truth likely resides somewhere in between. And this is where Smith’s play falters. The urgency behind telling these stories seems overly manufactured. In addition, James carries around artifacts from the event in a metal lunch pail, including a segment of noose and a bloody shirt. It’s a clunky piece of symbolism that doesn’t ring true, especially at the end when Marie suddenly doubts her version of things the very moment James takes an item very dear to her and places it in his metal memory box. But, overall, this is an articulate play with some excellent performances that intelligently examines a brutal moment in history in an unexpected way.